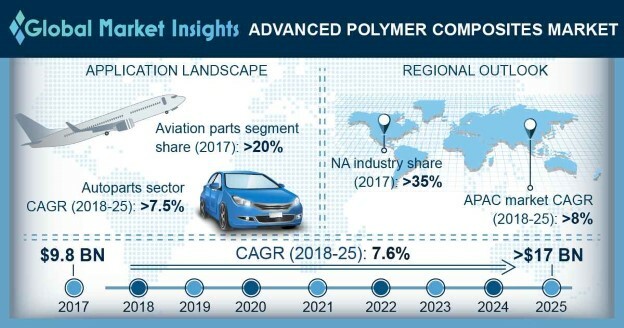 Advanced Polymer Composites Market size is forecast to exceed USD 17 billion by 2025; according to a new research report by Global Market Insights, Inc.
Sturdy growth in the aerospace industry, including commercial and civil airlines are the prime factors driving the advanced polymer composites market size in the coming years. The product delivers superior mechanical features including high abrasion resistance and strength, which makes it appropriate to find operations in aircraft parts production. Rising urbanization and increasing consumer spending power will propel the number of airline passengers globally. For instance, in 2006, the overall revenue passenger kilometers (RPK) was more than 4 billion and is poised to exceed 15 billion RPK by 2033. Rapid rise in the aircraft production with reduction in airline fares will accelerate the product demand in the expected timeframe. Advanced polymer composites market size is also influencing the automotive market with light weight and strong vehicle parts. For instance, global vehicle manufacturing in 2013 was roughly around 87 million units and is expected to exceed 130 million units over the forecast period. Socio economic aspects such as improved lifestyles and increasing disposable income has considerably propelled the automotive sales across the globe. Resins accounted for more than 55% of the overall advanced polymer composite market volume in 2017. Major resins include epoxy resins, phenolic resins and polyester resins. The high tensile strength and the anti-abrasion properties of the product will augment the advanced polymer composites market in the near future. The increasing need of high performance composites is to make components such as auto parts, wind blades, aviation components, boat structures and electrical conductors. Epoxy resins owing to high adhesive and water resistance properties are widely used in the boat building industry. Furthermore, high electric & flame resistance along with excellent mechanical strength makes them suitable to find widespread applications in electrical materials and metal bonding which will surely amplify the advanced polymer composites market size in the coming years. Advanced polymer composite market size for application in autoparts is projected to rise at a CAGR over 7.5% by 2025. In order to reduce GHG emissions from automobiles, various regulatory agencies such as Federal Highway Administration, U.S. EPA and EU Commission for Transportation have stipulated guidelines and legislations to reduce gross vehicular weight. This trend has been instrumental in driving plastics and composites demand in automotive components as an alternative to metals & alloys. which will make noteworthy contribution to the overall advanced polymer composites industry share in the near future. Similarly, growing requirement for high performance luxury vehicles for weight reduction, that enhances the vehicle’s performance as it improves power to weight ratio. Therefore, escalating commercial and personal vehicle demand across the globe will positively influence the complete advanced polymer composites market size in the coming years. In 2017, North America advanced polymer composites market size was over USD 3 billion. Advancements in terms of product development coupled with presence of major multinational companies have provided North America with growth advantage over other regions in the recent years. Drifting regional trend towards wind energy generation will positively influence the product demand. Moreover, strong aerospace industry in the U.S. will complement regional growth in the coming years. Advanced polymer composites market share is exceedingly consolidated, with prominent players accounting for over half of the total business size in 2017. The major players include Solvay S.A., Arkema S.A., Owens Corning Corporation, BASF SE, Cristex Ltd, SGL Carbon 3B-Fibreglass sprl, Kemrock Industries, TPI Composites Inc., Mitsubishi Rayon Co. Ltd., Toray Industries Inc., Hexcel Corporation, Koninklijke Ten Cate N.V. and Cytec Industries Inc.